James F. Gaertner, second from right, presents the President's Cup to Dean Lewis, whose team won the President's Cup '05 golf tournament, thanks to a hole in one by Rich Ballinger, second from left. Other team members were Mitch Muehsam, left, and Ed Blackburne, right. 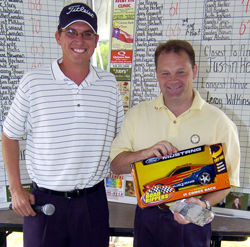 Raven Nest pro/emcee Ryan Polzin, left, presents a "car" to Rich Ballinger, who had a hole in one in the President's Cup '05 golf tournament. When Rich Ballinger saw his golf ball bounce once, check up, then roll into the cup at the 17th hole at Raven Nest Golf Club late last week, he jumped for joy thinking he was the proud winner of a four-day vacation to Puerto Rico. A hole later, he got even more worked up when told the hole in one winner at No. 17 would also be driving away with a brand new Mustang convertible, compliments of Hillcrest Ford. Ballinger says he's still excited, but he's not going on a trip anytime soon. He's also not driving a shiny, new ragtop Mustang. "It was kind of a bittersweet deal. I won a car and a vacation, however, since I'm a PGA professional, I was not eligible for those prizes," Ballinger said Tuesday. Ballinger, the director of Sam Houston State's new professional golf management program, didn't walk away empty-handed after recording an ace during the President's Cup tournament. He was presented a miniature version of the Mustang and $1,000 from Bill Fick, owner/operator of Hillcrest Ford. "Bill Fick was very, very kind to me," Ballinger said. "He felt so bad that it happened to me that he gave me $1,000 cash. That was a real act of kindness. He didn't have to do a thing, but he did this out of his own pocket." Fick said he felt obligated to do something. "It's hard to hit a hole in one. I just thought it was the right thing to do," he said. Playing in a group with Dean Lewis, Mitchell Muehsam and Ed Blackburne, Ballinger swung a perfect 6-iron on the 180-yard hole. "When I saw it go in, I ran to the back of the tee box to see I won a vacation," Ballinger said. "After playing (hole No.) 18, I was told that was the car hole. Then they said, 'Wait a minute, you're a PGA professional.'" Before the tournament, an insurance policy was purchased to protect the people who donated prizes to the tournament. That policy said golf professionals were not eligible to win any of the big prizes. Still, Ballinger seems satisfied after recording the second ace of his long golf career. "I was playing golf on a Friday, the weather was great, our team ended up winning the event and I got $1,000," Ballinger said. "That was a pretty good day." Tom Waddill can be reached at (936) 295-5407 ext. 3020 or by e-mail at twaddill@itemonline.com.